Search Results for "dinner table"
Mature parents with their two sons in the modern kitchen at dinner table , watching something from the laptop. Dinner table with dishware. Plates, napkins and wineglasses. Selfie, family making funny faces. Parents and daughter, dinner table. Child in all of us. Happy African American couple laughing at dinner table. Laptop facing camera. Replace screen with ad or message. 1940s: UNITED STATES: At the dinner table. Man and lady fill bowls with milk. Bibs dry on line. Dogs wear bibs and drink milk at table. Dog feeds pups. 1950s: Cat lays in pile of wrapping paper. Women sit on couch. Girl talks to mother. Family sits at dinner table and eats. 1920s: UNITED STATES: lady and man sit at table. Men in suits sit at dinner table. Children at table. 1953 - A man refuses to talk to his disobedient daughter at the dinner table, forcing his sister to make awkward attempts at conversation. Shot of a utensils set for a wedding, wedding dinner table. 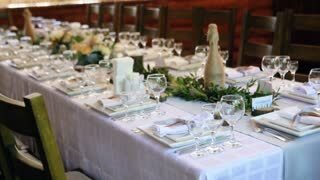 Top view of wedding dinner table in a restaurant. 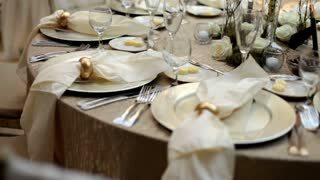 Wedding dinner table, set table in restaurant. Shooting of a beautiful wedding dinner table, fantastic service.